Golden Gate Cohousing is expanding! Open houses through October; at least 10 new rental openings. 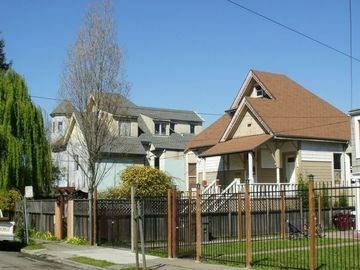 We are a young (in terms of community, not necessarily the members) all-rental nonprofit-owned cohousing community (and longtime EBCOHO Supporting Group member) in northwest Oakland (near Emeryville), a block east of San Pablo Avenue. We have started renovation and expansion of our second building, which we expect to be completed in January May 2017. We’ll have space for at least 10 more residents. We are starting the process of recruiting new members now because we are inviting people to join the community as (non-resident) provisional members for two to three months. This gives us time to get to know one another, explore our shared values, and work together before we each make a commitment. You may attend more than one if you like. We would appreciate if you would let us know when you plan to come by RSVPing through the appropriate links. The East (newly renovated) House will have three apartments, of two, three, and four bedrooms. The existing West House may have a studio or one-bedroom apartment available. Rents for bedrooms in the East House will range from about $650 to $1,000. Studio and one-bedroom units will be about $1,000 to $1,300. Move-in expense is first and last month’s rent, plus one month’s security deposit. Shared areas of the community include a large common kitchen, community room, multi-purpose room, laundry, accessible bathroom, guest room, outdoor dining patio, vegetable garden, fruit trees, two roof decks, back yard deck, bike shed, and workshop. The present community consists of six adults and two teenagers (one part time), in six separate apartments in the West House, plus four non-resident members. Golden Gate Cohousing’s mission is to provide affordable harmonious eco-housing for people helping to make the world a better place. Our Community Values include Earth Reverence, Respect, Integrity, Affordability, Balance, Flexibility, Diversity, Cooperation, Participation, Communication. Other Community Shared Interests include Family, Civic Engagement, Healthy Food, Creativity. There is much to be done to realize the community’s vision, which calls for a substantial contribution from all members. The community’s statement of Participation by Members provides more detail about this, and can be found on the website. We plan to have several shared meals each week, in which all members participate. No Jeff Billings Jack Sawyer Jonathan Youtt Did a host refer you?